Operation Yellow Elephant: Go Tigers! Thank you to Clemson University for truly supporting Veterans. Rodriguez found out this week he had been cleared by the NCAA and the Atlantic Coast Conference to join Clemson's football team as a walk-on receiver. Once Rodriguez trots onto the practice field Friday in his orange No. 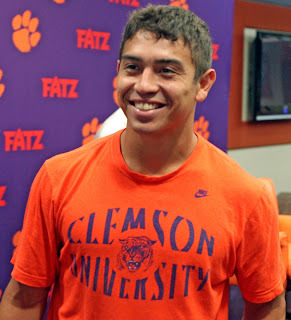 83 for Clemson's first practice, he'll complete a transformation from a struggling teenager to a young man who's achieved his goal after witnessing some of the most horrific fighting in Afghanistan. "It's been kind of long journey," he said Wednesday. Rodriguez played football at Brooke Point High in Stafford, Va., but acknowledged he let his parents' divorce and problems at school get the better of him. When his father Ray, died four days after graduation, Rodriguez was devastated and seeking a way out. He chose the Army. "I went to the recruiter and said, 'Get me away from here,'" Rodriguez said. Rodriguez served in Iraq during the troop surge of 2007. On his second tour, he found himself in Afghanistan and in the line of fire during one of the war's bloodiest fights, the battle of Kamdesh in October 2009.